Do you know what the most frequent questions are, here at Brilliant Family Dog? And I find in the course of answering these queries - not to mention my experiences from ten years of puppy classes! - that there are many things new puppy-owners just have no idea about. And life would be so much easier if they only knew! 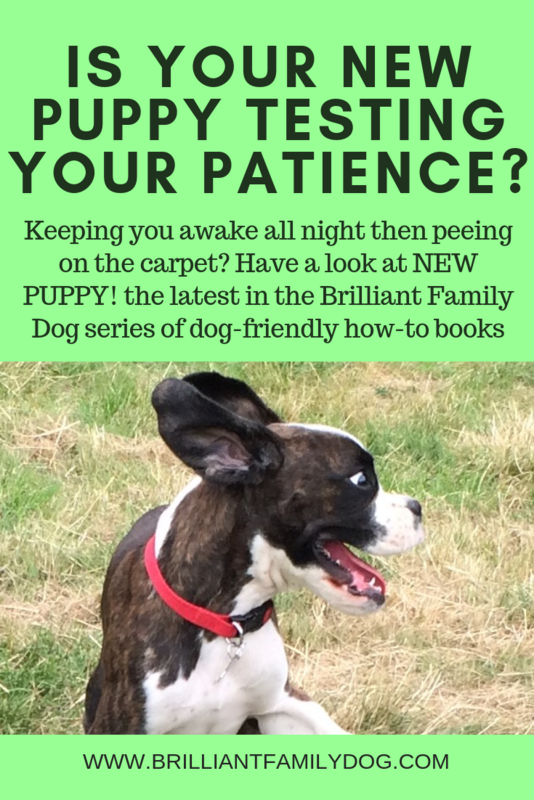 So I’ve put fingers to keyboard and added another book to the Brilliant Family Dog series of how-to books, designed specially for the ordinary dog-owner in the street - that’s you, most probably. Most people aren’t looking to compete with their dogs, or turn them into performance dogs of some kind. Most people just want a Brilliant Family Dog they can take anywhere, that will enhance their family lives … not make them ten times worse! So I’ve written this book with this very much at the front of my mind. You won’t find endless scientific hypotheses, lengthy training programs, or explanations of what is normal for a puppy without telling you what on earth to do about it. Instead, it tells you what you need to know, and doesn’t waste your time on stuff you don’t need to get confused by. You get solid advice from the front line. Apart from the thousands of puppies I’ve had the privilege to work with down the years - in classes, on group walks and boarding in my home - there are my own many dogs who all started out with me as young pups. Every dog is different, and every dog is valuable. Every family is different too - and you are just as valuable! So getting this “marriage” to work needs attention from the outset. So often a puppy comes into a new home - it’s all excitement and craziness. There’s little structure, and sometimes not so much understanding. Love is wonderful … but you need to be armed with more than love to survive those early weeks without losing your sanity, or your cool - or turning your puppy into a “naughty dog”. Once you “know your enemy”, you can manage your household in such a way that your puppy never gets to do anything you don’t like! Imagine that! And yes, it is possible. If your home so far has resembled a war zone, with possessions destroyed, carpets ruined, and garden looking like a building site, it’s only because you don’t yet know this stuff. Get yourself the book - preferably before your next puppy arrives in your home! - and Be Prepared. And if you have no puppy plans right now, this book would make a marvellous present for someone who’s about to get a puppy, or someone who has those bleeding hands, ripped sleeves, and bags under the eyes that show that they are battling with a fluffy little monster with horns and a forked tail, aka their new puppy. Socialisation - just what does it mean? Exercise - how often? How much? Feeding - how often? How much? What to feed?